Join us as we quest to the centre of the Aztec rainforest in search of great treasures. Today, we’re looking at the Jaguar Temple slot machine from Thunderkick games. We’ll be analysing its gameplay features, its look and feel, and everything else notable about the title. In terms of game specifics, the grid is a standard five by three layout and there is a total of 20 win lines for players to match symbols along to form winning combinations. There is also the possibility of dropping mega money by filling the screen with Jaguar symbols – more on that later though! Opportunity to win a massive prize on a single spin. Ok, 1,000x the total bet isn’t the biggest payment ever on a slot machine (not by a long shot). However, for Thunderkick games, it’s huge! Great artwork and theme. Raiding ancient temples for treasures might be a tried and tested formula but the Jaguar Temple slot machine adds on lucrative prize opportunities, as well as some interesting bonus features. This makes for a game with a lot of replay value. Not possible to adjust number of win lines or number of coins bet on each one. This is a minor quibble, but the betting limits feel overly basic on many Thunderkick titles. No true second screen bonus. With such a theme, this feels like a missed opportunity. Jaguar = 50x the total bet. Fish = 25x the total bet. Rabbit = 20x the total bet. Hyena = 17.5x the total bet. Bird = 15x the total bet. Landing three or more Jaguar symbols adjacent to one another along a pay line will trigger a win. The Jaguar symbol can occur both as a 1×1 symbol and as a 3×3 symbol. The Jaguar 3×3 symbol may randomly occur on any spin on the three middle reels. What’s more, during the Bonus Game, the 3×3 symbol will occur more frequently. Finally, if you’re lucky enough to land a full screen of Jaguar symbols, you will be awarded with a massive 1,000x the total bet placed! Not bad at all! The “wild” symbol is represented by a warrior in Aztec headdress. 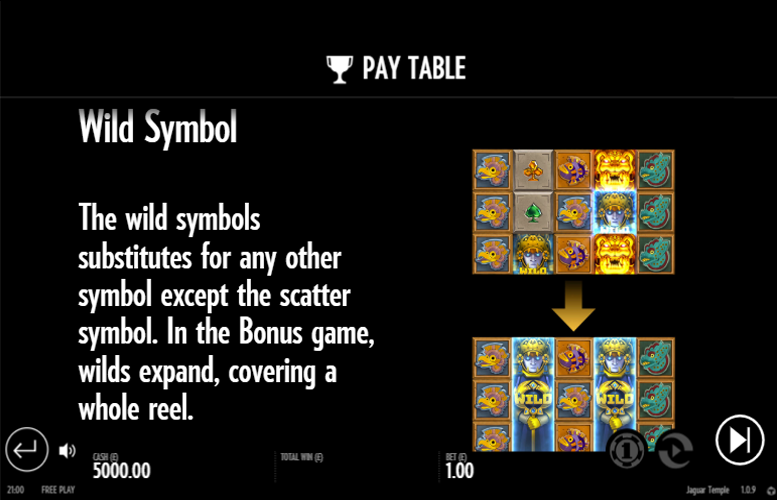 During the base game, “wild” symbols are individual icons (1×1). However, during the Bonus Game, “wilds” will expand and cover an entire reel! Landing three or more “scatter” symbols will trigger the Bonus Game. These “scatters” look like some form of ancient locking mechanism to the temple itself. 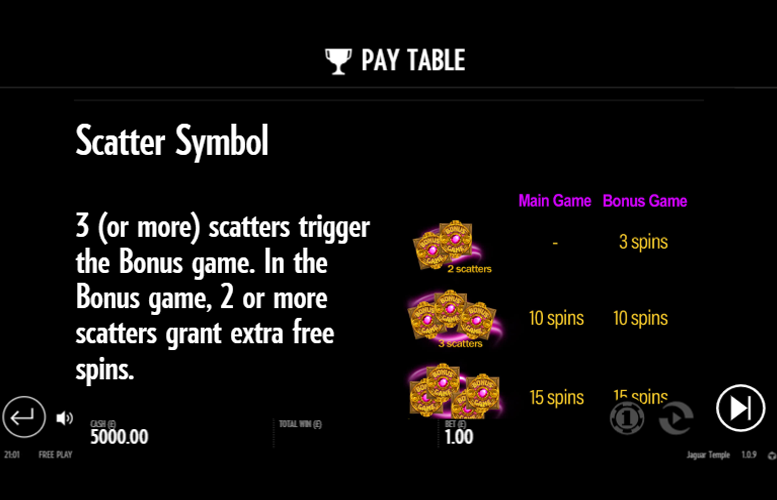 Three “Scatter” Symbols = 10 free spins during main game, 10 free spins during Bonus Game. Four “Scatter” Symbols = 15 free spins during main game, 15 free spins during Bonus Game. 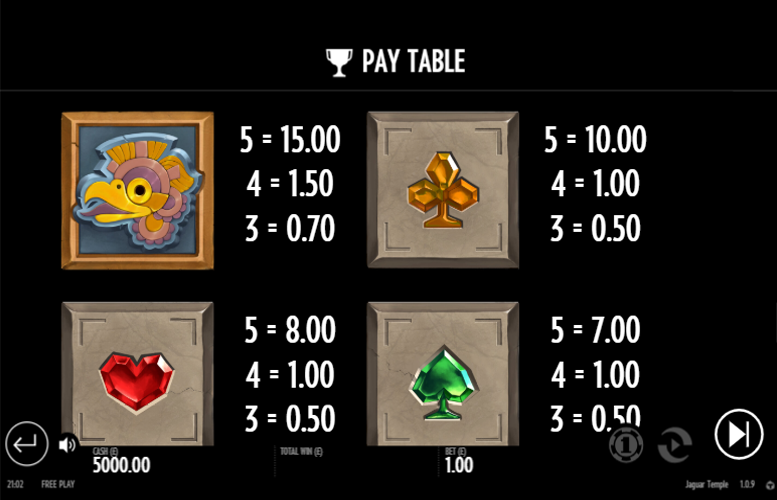 Five “Scatter” Symbols = 20 free spins during main game, 20 free spins during Bonus Game. In addition to the symbols on Jaguar Temple that pay the very best prizes. There are also some that award lesser payments. These are represented by the four suits found in a standard deck of playing cards. As usual, we’ve listed the prizes for hitting five-of-a-kind of each below. Club = 10x the total bet. Heart = 8x the total bet. Spade = 7x the total bet. Diamond = 5x the total bet. 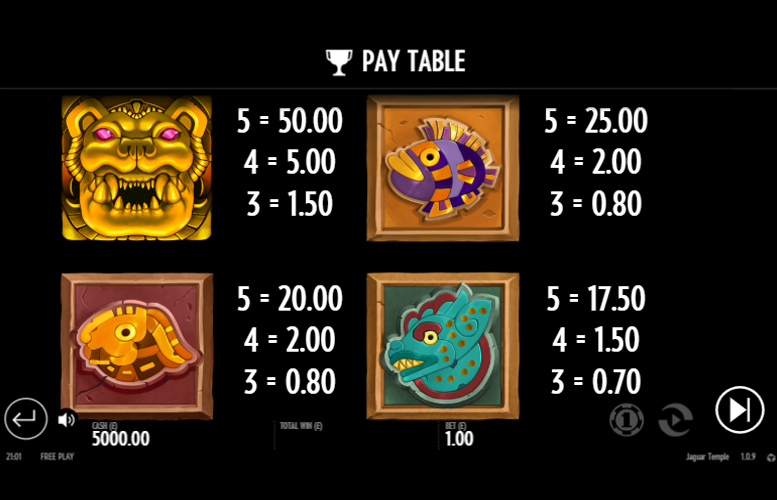 Unlike many slots, players aren’t given free reign to distribute their bets as they please on Jaguar Temple. Missing are options to adjust the number of win lines bet on and the value of each bet placed on them. Instead, players are presented with a total of 12 different total bet amounts to select from. These range from a low of just 10p, up to a high of £100. As you can see, the Jaguar Temple slot machine caters for most bankrolls. However, those wishing to bet massive stacks of cash per spin might find the £100 maximum bet overly limiting. 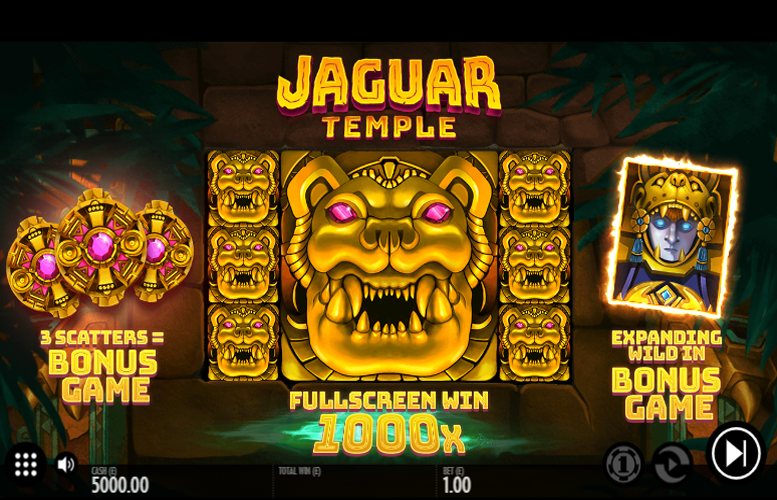 The Jaguar Temple slot machine is one of the stronger Thunderkick games we’ve reviewed to date. It manages to strike a good balance between juicy payments and gameplay features, whilst still retaining a decent return-to-player rating. The artwork and music also combine to create a machine that looks, sounds, and most importantly plays great! We strongly recommend giving it a go. This game has a rating of 4 / 5 with 806 total reviews by the users.